CADETS - our "raison d'être"
We are a proud member of the Historic Naval Ships Association. 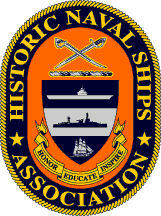 The Historic Naval Ships Association has 175 member ships. Part of their mandate is "To educate the public on the rich naval maritime heritage of the member ships; the roles these ships have played in their countries' histories; and the importance of preserving historic naval ships for future generations." Similarely, the Pogo is frequently involved in public educational events such as "open doors" events and historic boat shows. The Pogo is one of only five Canadian vessels who are members and is the only one that is still fully operational.